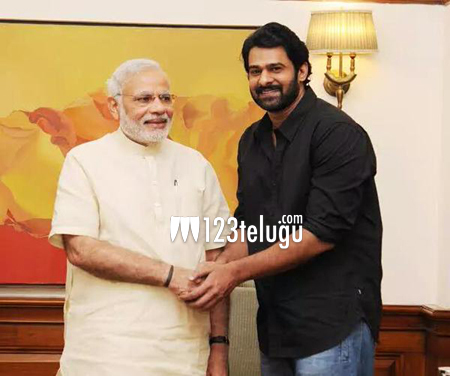 Young Rebel Star and the macho actor who breathed life into the ferocious character Baahubali, Prabhas, has met with the Indian Prime Minister Narendra Modi at his official residence 7, Race Course Road in New Delhi, just a while ago. Speaking to the media following his interaction with the PM, Prabhas said that he asked the Prime Minister to watch Baahubali and the PM politely obliged to watch it at his leisure. Since yesterday, Prabhas has been meeting all the bigwigs in the national political circuit and he has already met the Union Home Minister Rajnath Singh, senior BJP leader LK Advani, who watched the film and praised it to no limits. Meanwhile, Baahubali has amassed more than 450 crores at the worldwide box-office and still looks unstoppable even in its third week’s run.